Roj Bahman Mah Shehrevar, 1383 Yz. Now Rostam rode on atop Raksh. Soon they entered an intensely forested area which was so cut off from sunlight that even in broad day light it was pitch dark. Since Rostam could not see a thing he loosened the reigns and let Raksh find the way using his innate sense of smell. After quite some time, they emerged out of the forest. Rostam’s clothes were soaked with sweat. Soon they came across a beautiful place full of sunlight and flowing streams. Here Rostam took off his outer clothes and spread them out to dry while he rested a bit and let Raksh free to pasture. Now the forest guard who was on his routine rounds saw Rostam sleeping and Raksh grazing in the area and was enraged that a stranger had entered his fiefdom. He came running with his staff and struck a heavy blow with it on Raksh. Hearing the commotion Rostam got up from his slumber. As he saw what had happened, Rostam lost his temper and without saying a single word, he pulled the ears of the forest guard with such force that they were ripped off his head. The forest guard ran away, carrying his severed ears to his superior, the knight of the domain called Oolad. Soon Oolad gathered a posse of soldiers and rode towards Rostam. As Rostam made short work of the soldiers, Oolad tried to flee but Rostam expertly threw his sixty-looped lasso and caught him. He then tied him up severely with a rope and questioned him on the area, the Devs resident there and the whereabouts of Sapeed Dev and the captured King Kai Kaus. Rostam promised Oolad that if he were true in his replies then Rostam would make him the King of Mazandran after killing the Sapeed Dev. Oolad spilled the beans and gave all the intricate details as well as an idea of the tremendous opposition that awaited Rostam in his quest to find and free King Kai Kaus and finish off the Sapeed Dev. At every step, Oolad remonstrated to Rostam that even though he were the world champion it would be impossible for him to single-handedly finish the task. Rostam of course paid no attention to the dangers and commanded Oolad to lead the way towards the evil ones. Soon they were on their way. By nightfall they reached the foothills of Mount Esperooz where far off in the distance they saw various fires lit inside the city walls of Mazandran as the night guards kept watch. Among the various tents of the Devs, Oolad pointed out the largest tent which belonged to the feared Arzhang Dev, who was well-known for his habit of roaring loudly from time to time. In this manner the fifth obstacle was crossed. Pesar bar pedar bar hami raah jost! When the evil ones saw the mighty mace of Rostam, and they saw the hand that held it, their hearts burst with terror! And without caring about their land, their country and their farms, they all ran away, the son running over his own father in pure fright! After having had his fill of combat, Rostam rode back to the foothills of Mount Esperooz and questioned Oolad on the way ahead towards the imprisoned Kai Kaus. After getting his directions and taking Oolad along, Rostam rode towards his ultimate destination. As they neared the deep pit where the Iranian monarch lay imprisoned, Raksh neighed loudly. 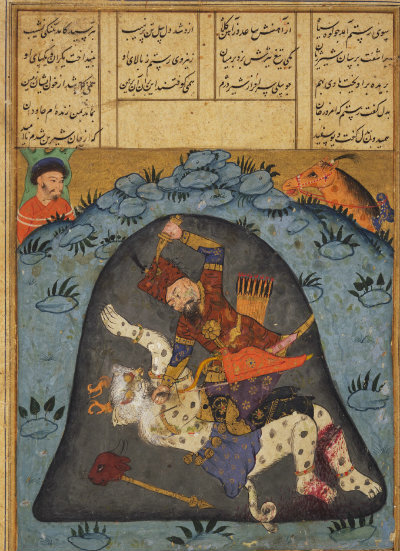 Lying deep in his miserable pit, King Kai Kaus, with the power of his Kayanian Khoreh heard the noise of the valiant steed. The despondent King perked up and remarked to his fellow prisoners that at last their days of suffering were coming to an end, for Rostam was nearby. Ze Zaalash beporsido az ranje raah! As they were in discussion, the great Pahelwan, the immensely brave Rostam strode in, with his waist tightly tied for battle and stood next to them! As the Elephant approached the King, all the nobles gathered around him – Gudarz, Toos, the brave Gev, Gastahem, Shidosh and the lion-like Bahram. Rostam shed many tears and bowed low to his King and asked him the details of his cruel imprisonment for such a long time. King Kai Kaus hugged Rostam and held him by his side and inquired about the health of Zaal and the many troubles he must have faced on the way! These moving lines of Firdausi not only show the heroic meeting between the King and his rescuer but also offer deep understanding of the great stature of Iranian nobles and their worthy King. Be he may the bravest warrior of the world, but Rostam was no stranger to tears. Seeing the plight of his King – blind, without crown and on the verge of death by starvation, Rostam wept openly, without any shame. He immediately asked Kaus about his hardships. But ere, the King shows his Kayanian Khoreh and valour! Rather than dwell on his own miserable condition, the King hugs Rostam and holds him next to his side – a rare honour, since Kayanian Kings would never touch another person. 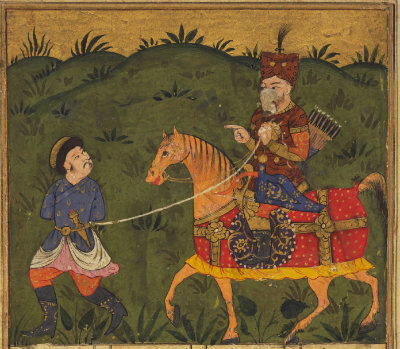 Instead of his own difficulties, the Shah of Iran questioned Rostam about his father Zaal as well as the difficulties that Rostam must have faced crossing the Haft Khan to come so quickly to his King! Readers of Frashogard, this was the standard of our nobles and our Zoroastrian Kings! Where have they all disappeared and in what miserable condition lies our community today! When will the day of our own freedom from this misery come? Soon the King asked Rostam to finish off his seventh and last peril – the killing of Sapeed Dev. The King revealed to Rostam the secret that the blindness that had afflicted the King and his army would be removed only when three drops of blood from the Sapeed Dev’s brain and heart would be poured into each person’s eye. Hence it was of utmost importance that the killing of the Sapeed Dev be handled in a most cautious manner. Now Rostam departed from the cave and began the journey towards the lair of the Sapeed Dev which lay over seven hills each hill swarming with thousands of Devs. As they rode fast, Rostam slaughtered all the Devs and laid behind him a trail of destruction that would break the backs of the evil doers for many decades. Finally they reached the place where the cave of Sapeed Dev was situated. Here, Oolad advised Rostam to wait till the sun was at its zenith, since that was the time when Sapeed Dev went to sleep. Rostam agreed and they rested till the time the Sun was at its zenith. In this manner, the sixth ordeal of the Haft Khan was crossed. Now as the sun rose to its zenith, Rostam got ready and strode into the hellish cave of Sapeed Dev. The cave was so dark that Rostam could not see anything. He waited for a few minutes till his eyes got accustomed to the darkness and then he spied the Sapeed Dev, sleeping in a corner. He was so huge that even Rostam, for once, was filled with terror at the thought of fighting with him. But his innate faculties immediately banished the fear and with a loud roar, Rostam woke up Sapeed Dev. As the evil one awoke Rostam rushed on to him with drawn sword and with a swift blow cut of one hand and one leg of Sapeed Dev. 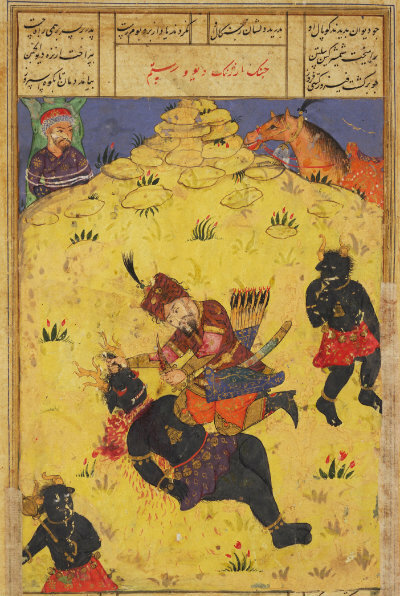 Yet the fiendish demon continued to fight with great strength, matching Rostam blow for blow. Both dealt heavy blows on each other and soon the floor of the cave was strewn with pieces of flesh – both of Rostam and Sapeed Dev. As the fight progressed, Rostam finally gathered his last reserves of strength and grabbed the Dev’s neck and dealt him to the floor with such force that Sapeed Dev died that instant. Working quickly Rostam unsheathed his dagger and cut off the brain and heart of the fiend. He then came out of the cave with his trophies. Rostam was covered with blood and gore. He removed his armour and clothes, washed himself in a clean spring and then bowed low and offered his prayer of thanks to the Creator for making him successful. He then collected Oolad and the precious cargo and the two rode back to the cave where Kai Kaus was imprisoned. There Rostam poured the three drops of blood from the Dev’s heart into the eyes of Kai Kaus and the monarch could see once again. Soon all the nobles and soldiers were also treated in the same manner. Now the Iranians restored Kai Kaus to the throne and for seven days they made merry. On the eighth day they set about destroying the city of Mazandran and all its shrines of evil. Barin aafrin kard Kaus Shah! Nashaayad gozaz aafrin kard yaad! Hazzar aafrin baad bar Zaalezar! Abar marze Zaabul saraasar degar! Hamaanaa ke chun tu zamaanah nadid! Padshah Kai Kaus showered benedictions on Rostam: ‘without you there is neither Crown nor army! No words of praise are enough for the mother that gave birth to you! Thousands of blessings on Zaalezar and the land of Zabul, that gave birth to a valiant son like you! Verily, there is none other in this entire age, who can match you, O Rostam! These words of praise are not merely poetic, but they reveal the divine fact, that in the entire 81,000 year cycle of the current Zravane Darego Khadata, there is no other person who can match Rostam in his bravery and valour. In this manner the Haft Khan of Rostam were accomplished and King Kai Kaus was rescued from captivity. Indeed in the entire 81,000 year cycle of the current Zravane Darego Khadata, there can be no other person who can match Rostam in his bravery and valor, After the Shanameh exhibition last month the total image of Rostom has changed, for me; from only being a mighty pehelwan to a highly evolved divine soldier who not only have enormous physical and mental strength but also had achieved much spiritual enlightenment in his life. thank you for this beautiful story, a story which happened thousands of years ago in a land where most of us have not visited, but still makes us proud of our history and heritage.